Thank you for coming to us with your questions and concerns. Many of our most commonly asked questions and solutions can be found here to help troubleshoot any issues you may encounter. If you don't see the solution or answer you need, feel free to send us a description of the problem using the Ask for Help form or by calling us at 800-4PTWISE. One of our knowledgeable support engineers will help you get the answers you need. Where do I download Pointwise? The latest version of Pointwise can be downloaded from: http://www.pointwise.com/downloads. Do I need to be a system administrator/root to install Pointwise? On Windows platforms, you should install Pointwise as Administrator/root. If you have administrator privileges, you can right-click the Pointwise installer file and select Run as Administrator. On Linux and Mac platforms, you can install as a user or as Administrator/root. How do I tell Pointwise which license server to use? When Pointwise is installed on a client machine and started, it looks at the local area network to see if there is a Reprise License Manager (RLM) server currently “broadcasting” on that network that contains a valid Pointwise license. If there is, Pointwise automatically connects to that server. Select Specify a License Server. Enter the name of the license server and its RLM port. If Pointwise cannot find a license server in Step 1, the Pointwise License Wizard will launch automatically. Simply follow the remaining steps outlined above. Can I borrow a Pointwise process from my license server? How? On your laptop, connect to the same local area network (LAN) as your license server. In the Roam License frame, enter the Number of Days you wish to borrow a process of Pointwise. You will see a message in the Messages window stating that a roaming license was obtained for Pointwise and will expire in the number of days you specified in Step 4. Disconnect your laptop from the LAN. Note the maximum number of days that you can borrow a process is 30 days. In the Pointwise interface, this will be displayed as 31 days because each day is counted until midnight. For example, if you chose to borrow a process for 15 days, the first day would end at midnight on the day you borrowed the process. For more information on how license roaming works for the Reprise License Manager (RLM), please refer to the RLM license administration documentation available at: http://www.reprisesoftware.com/RLM_License_Administration.pdf. How do I return a borrowed Pointwise process early? You will see a message in the Messages window stating that a roaming license was returned early. Note: When a license is borrowed (or roaming), it depends on the version of the license file on the license server remaining fixed. If that file is changed, it can prevent the early return of a borrowed process. For more information, please refer to the RLM license administration documentation available at: http://www.reprisesoftware.com/RLM_License_Administration.pdf. Can I run Pointwise via remote execution? Pointwise is currently unsupported for remote execution. Most remote execution approaches do not have the graphics support necessary for Pointwise to function properly. For best results, we recommend that you install Pointwise locally on your workstation and use your remote server only for licensing. We have received reports of customers making Pointwise work through remote execution but typically it is at a large performance penalty. If you wish to attempt remote execution of Pointwise, here are some platform-specific recommendations that may help you. On your workstation, click Start. Type Remote Desktop Connection and enter the connection details for your remote Windows machine. On the remote Windows machine, click Start. When the cmd command and icon appear, right-click on the icon and select Run as Administrator. Note the ID for the console session. You will need it for the next command. Type tscon sessionID /dest:console where sessionID is the ID noted in the previous step. Type start $PointwiseHome\win64\bin\Pointwise.exe where $PointwiseHome is your installation directory for Pointwise. This step may terminate your connection with the remote machine. However, Pointwise should be running when a new remote connection is established. VNC Servers typically provide sufficient resources to run Pointwise remotely. TightVNC has been used successfully to run Pointwise remotely on Windows. In general, remote display of Pointwise from a Linux workstation is impossible without VirtualGL or similar software that gives Linux remote display software the ability to run OpenGL applications with full 3D hardware acceleration. Instructions on how to download, install, and configuration of VirtualGL is available on the VirtualGL documentation page. Out of Date GPU Drivers: We recommend you first have the latest proprietary drivers for your GPU installed. Running Headless: If your host machine is running headless (without a monitor), you may need to configure your drivers to run in a headless mode for VirtualGL to properly connect. The instructions below are for Linux machines running with NVIDIA graphics hardware and proprietary drivers. If you are using a graphics card from a different manufacturer, please consult their documentation for the relevant steps. -a Configure an X screen on every GPU in the system. --use-display-device=None Force the X driver to use the display device "None"
If none of these suggestions have resolved your issue, it may require further debugging. Please run Pointwise with the following arguments and send the output to support@pointwise.com. Which platforms are supported by Pointwise? 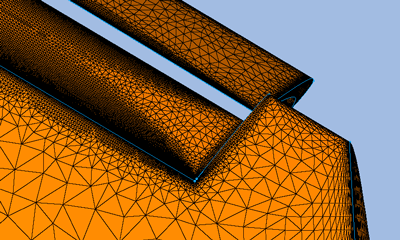 Pointwise supports the most popular desktop workstations in use today by CAE engineers. The application supports each platform's native look-and-feel and provides 3D graphics through the OpenGL industry standard. Pointwise's native project file is portable across all supported platforms. This RLM troubleshooting guide provides a quick reference to common questions Pointwise has received from our customers about our new license manager. This resource should not be seen as a comprehensive guide to using the Reprise License Manager. If you need detailed information about how to administer RLM on your server, you should use the RLM License Administration guide provided by Reprise Software. Where do I download RLM? I am a license administrator for my site. Where can I get more information about RLM? Refer to the 'For License Administrators' section of the RLM support page. Do I need to be a system administrator/root to install RLM? On Windows platforms, you should install Pointwise as Administrator/root. If you have administrator privileges, you can right-click the RLM installer file and select Run as Administrator. On Linux and Mac platforms, we recommend that you do not install as Administrator/root. Click here to watch an associated video that helps explain these steps. An activation key is a 16-digit numeric string that the Reprise License Manager (RLM) installed on your machine will use to contact Pointwise. The expiration date and number of processes of Pointwise for your license server are encoded in this key. Once an activation key is entered during the RLM installation process, your workstation sends its Host Name and Host ID to the Pointwise license server. A text-based license file is generated based on your workstation information, expiration date, and number of processes of Pointwise for your site. It is sent back to your workstation, installed, and the Pointwise license server started automatically for you. Caution should be exercised when using your activation key. Install RLM and enter the activation key only on the machine that you intend to be your license server. When you install RLM on a machine and enter your activation key, it contacts the Pointwise Activation Key server and requests a license file. This license file is then installed in your RLM server and the server started automatically. For customers who complete the Pointwise license request form, Pointwise will send a license file instead of an activation key. This will be necessary for customers with a secure network or a workstation that has no internet connection. You can request an activation key by completing the license request form at: http://www.pointwise.com/licenses. You can request a license file if you have a machine without an internet connection or if you are on a secure network that will not allow activation keys. Go to the license request form at: www.pointwise.com/licenses. Enter your activation key (if you were sent one), hostname and host ID of your license server machine. Finish completing the form and submit it. Pointwise will send you a license file within 24 hours of your submission. How can I find my license server’s host name and host ID? The Reprise License Manager (RLM) is installed with a license administration webpage that will assist you in finding your server information. Windows: Start, All Apps, Pointwise, RLM License Administration. Linux/Mac: Enter the URL http://localhost:5054/ where localhost is your existing license server machine name. Click System Info on the left toolbar. Record the host name displayed at the top of the page. Record the Ethernet address listed under Hostids. If there are multiple Ethernet addresses, only record the first one. How do I update my existing license server with a new activation key? Please see our instructions on how to update an activation key below under the Pointwise and RLM Installation Help heading. How do I update my existing license server with a new license file? Please see our instructions on how to update a license file below under the Pointwise and RLM Installation Help heading. Why doesn't my activation key work during installation? You may not be connected to the internet. Open a browser to www.pointwise.com to check your internet access. 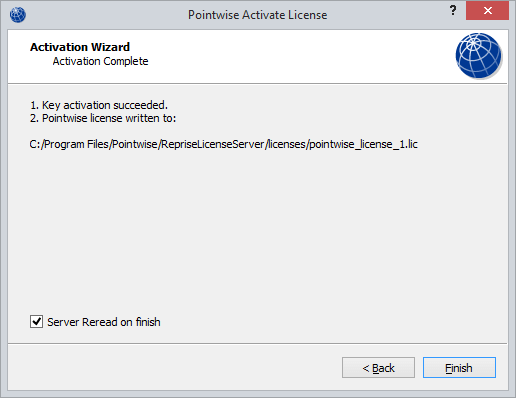 When you are updating your RLM server, you'll run the Pointwise License Wizard and enter the activation key. You may have a firewall blocking the port (80) used by the activation key server to send your license file. Open port 80 in your firewall. Install RLM with your activation key. You may have a proxy server that is interfering with the activation process. On Windows systems, proxy server settings are automatically detected and used by the RLM installer during activation. On Linux and Mac workstations, there is an environment variable for a proxy server that will need to be set for activation to work properly. where MyProxyHost and 1234 are your Proxy Server name and port. Additionally, if your proxy server uses authentication, you will have to set an additional environment variable to pass the credentials to the proxy server. Please note that RLM activation only supports the BASIC authentication type for proxy servers. where ProxyUsername and ProxyUser_Password are your username and password for the proxy server. If these solutions do not work for you, please complete the license request form. Provide us with your server's host name and host ID and an alternative license type will be sent to you in place of your activation key. How do I shut down the RLM server? Click Shutdown on the left toolbar. In the ISV pull-down, select PWID. How do I start the RLM server? Right-click Pointwise RLM License Server in the list of services. Note: If you did not find Pointwise RLM License Server in the list of services on your Windows machine, it may have not been started because of a failed or aborted installation. In this situation, try uninstalling and reinstalling RLM. If that does not work, please contact support@pointwise.com for further assistance. How do I install and set up a redundant server? Please see our instructions on how to set up redundant servers for RLM below. I work in a secure area with no internet access. Can I use an activation key? The activation key uses an internet connection to contact Pointwise's servers and request a license file based on your workstation's host name and host ID (Ethernet address). If your system does not have an internet connection or is on a very secure network, you will be unable to use an activation key. In these situations, Pointwise will provide you with a text-based license file which you can install on the license server. You can request one of these license files by completing our license request form. You will be asked to provide your activation key (if you were provided one), host name and host ID for the license server at that time. Can I run Pointwise V18 with a FlexNet license server? Pointwise V18 will only run with the Reprise License Manager (RLM). If you are moving to Pointwise V18 from V17, you will need to download and install the new RLM server to run the latest Pointwise. This RLM server will not run versions of Pointwise prior to V18. Instructions on how to install RLM and Pointwise V18 can be found at: www.pointwise.com/downloads. Can I run Pointwise V17 with RLM? Pointwise V17 will only run with the FlexNet license manager. This version of Pointwise cannot be served a license from the Reprise License Manager (RLM). Can I run Gridgen V15.18 with RLM? Gridgen V15.18 will only run with the FlexNet license manager. Gridgen cannot be served a license from the Reprise License Manager (RLM). What ports does RLM use? One additional port will be randomly chosen at launch for each ISV you are running with RLM. I’m getting warnings about “System clock” and “windback” issues. How do I fix that? If a license manager software application senses that the computer system clock has been tampered with, it assumes that somebody is trying to game the system into using the license longer. RLM checks the time and date on several key files every time it starts to detect any clock tinkering. If it detects an inconsistency, it won't serve licenses. First try a reboot. This sometimes clears the error. On a Linux system, RLM is looking in the /etc, /var/adm, and /var/log folders. Use the touch command to update the correct time stamps on the file. Download Reprise License Manager (RLM). Complete RLM installation files can be downloaded from our downloads page. Install the RLM license manager. Review the status of your RLM license manager. Download Pointwise. The current production release of Pointwise can be downloaded from our downloads page. If Pointwise cannot find the RLM license server automatically, the Pointwise License Wizard will appear. Select Specify a License Server and enter the name of your server. Download and run the RLM installer in Step 1. At the Configure Pointwise RLM License Server screen, make sure the Activate Pointwise License option is unchecked. Without an internet connection or on a secure network, an activation key cannot be used. The RLM License Administration page should open in your web browser. If it does not open automatically, please go to: http://localhost:5054/. Click on System Info on the left toolbar. At the top of the page, record the host name of your workstation that is listed. If you need to get the host name from a command line, please use the command hostname. Record the Ethernet address listed for your workstation under the Hostids header. For systems with multiple host IDs, note the first host ID listed. This host ID may differ from the one used for FlexNet (or other license managers). Please record the host ID reported in the RLM License Administration webpage. You should have already received a license file from Pointwise. If you have not, go to https://www.pointwise.com/licenses and complete the form. Enter the host name and host ID you recorded in Steps 7 and 8 respectively. You should receive an email from Pointwise within 24 hours with a license file attached. Go to the RLM License Administration webpage (http://localhost:5054/). Click Edit License File on the left toolbar. Press Enter after typing pointwise_license.lic into License File to create or edit. Paste the contents of the license file you received from Pointwise into the text box. Click Status on the left toolbar to ensure that the Pointwise license server is now running. Download and install Pointwise using Steps 4-5 at www.pointwise.com/downloads/pointwise-rlm.html. If you do not already have an activation key, please go to www.pointwise.com/licenses/ and request one. You will receive an activation key from Pointwise within 24 hours that will be of the form: 1234-1234-1234-1234. From the Start menu, choose All Apps, Pointwise, RLM Update Activation Key. Please note you will need administrator privileges to use this tool. Enter the activation key in the Pointwise Activate License wizard and click Activate. Navigate to $RLM_Install_Directory/Pointwise/RepriseLicenseManager/macosx and double-click the Pointwise Activate Wizard icon. You should receive a message that informs you of successful key activation. Navigate to $RLM_Install_Directory/Pointwise/RepriseLicenseManager/linux_x86_64 and double-click the Pointwise Activate Wizard icon. Click Edit License Files on the left toolbar. Select your existing Pointwise license file from the License File to Edit pull-down. Open the new license file you received from Pointwise in a text editor. Copy the contents of the new license file. In the Edit license file webpage, replace the existing Pointwise license file text with the new license file text you copied. Click Reread/Restart Servers on the left toolbar. Your license file has now been updated and the server restarted based on it. A redundant server configuration allows you to have a failover (or secondary) license server in the event that your primary license server fails. These steps will walk you through the process needed to install and start RLM on a redundant server configuration. If you do not have license files for your primary and secondary servers, use the below steps to request them. If you already have both of your license files, please skip ahead to Installation. Download and run the RLM installer in Step 1. Important: Install RLM as Administrator/root on Windows machines. At the Configure Pointwise RLM License Server screen, make sure the Activate Pointwise License option is unchecked. For a redundant configuration, you will need to install a license file on each server instead of an activation key. Example: RLM Info for System: MyWorkstationHostName. Go to www.pointwise.com/licenses and complete the form for the primary and secondary servers. Enter the host name and host ID you recorded in Steps 7 and 8 for the primary and secondary servers. Open the license file for your secondary server with a text editor. where MYSERVER is the name of your primary server. Save the secondary server license file. How can I install RLM/Pointwise in unattended mode? Where are my installation log files for RLM? The answer depends on your operating system. Where are my installation log files for Pointwise? My MacOS reports that the Pointwise and RLM installers are “damaged”. What should I do? When using our MacOS installers (Pointwise and RLM), you may get an error message indicating that the files are damaged and they should be moved to the trash. It seems that with the latest OSX release, Apple has taken their Gatekeeper protection to a new level by hiding the option to allow third-party apps to be installed. In the past, you were able to manually go into the Security & Privacy panel and choose the Anywhere option; it seems that Apple has now hidden this option. Hit Return and authenticate with an admin password. Go to Security & Privacy. You will now see the Anywhere option inside the Allow Apps downloaded from: frame.